Crocus refers to a genus of several dozen species of small clump-forming perennials that have their origins in many different Zone 3 regions from southern Europe to China. They are most noted for being some of the very earliest spring flowers. 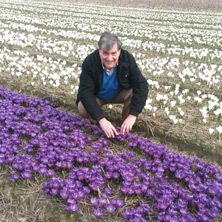 Crocus have since been cultivated into a wide variety of hybrids, most developed in Holland. Crocus are most impressive when planted en masse. Pick out a large, sunny spot in the garden, the lawn or a wild area such as a rocky slope. Plant large drifts using groupings of 20–30 bulbs spaced about 8–10 cm apart. Crocus are ideal for this kind of naturalizing. Many varieties will thrive and bloom for upwards of 20 years! In the lawn, crocus have perfect timing. They will bloom well before grass starts to grow; by the time your lawn reaches mowing height, the crocus are finished for the season. Established crocus clumps bloom earlier than first-year plantings, so avoid planning your garden colours around first-year bloom times. Crocus are easy to grow! Plant yours in the fall in large drifts anywhere you have sun to partial shade. 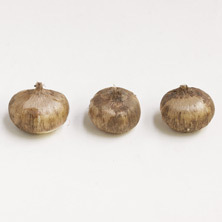 Place bulbs 8–15 cm deep and space them about 8–10 cm apart. 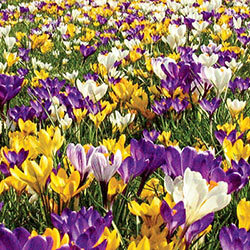 Crocus require almost no care and are hardy in zones 4–8. If your crocus perform poorly, the most likely reason is overwatering in the summer. Crocus prefer their soil damper in the spring and fall, but dry and warm during the summer. Never plant crocus near summer annuals or other thirsty summer blooms. As you give the annuals the water they need, you will be “drowning” the crocus and shortening their lives. Excellent companion plants for crocus include flowering quince, forsythia, Asian jasmine and witch hazel.